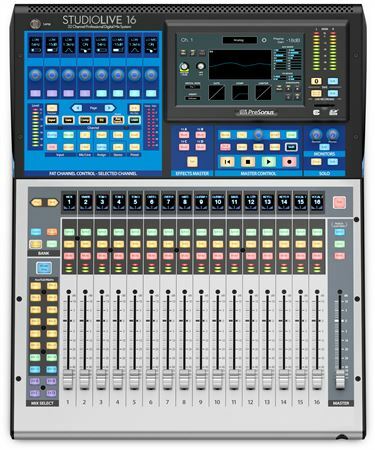 Shop PreSonus StudioLive Series III SLMAD16 16 Channel Digital Mixer from AMS with 0% Interest Payment Plans and Free Shipping. Featuring PreSonus’ legendary ease of use, the powerful StudioLive 16 is a third-generation mixer which has fully recallable, with touch-sensitive, motorized faders and recallable XMAX preamps. The StudioLive 16 has a fader for each input channel and 1-to-1 workflow, and adds new customizable Fat Channel controls. Its studio-grade sound is enhanced with all new Fat Channel processing, including a plug-in-style workflow that features vintage-style EQ and compression options on every channel. You get 16 FlexMixes that can be Aux, Subgroup, or Matrix mixes; 6-band fully parametric EQ on all mix outputs; 24 DCA groups; and built-in AVB networking. In addition to 40x40 USB and 55x55 AVB recording interfaces, the StudioLive 16 features an onboard multitrack SD recorder with Capture one-touch recording, true virtual soundcheck, and mix scene transfers to Studio One—without a computer. I love it! Best investment in my studio and live performance setup. This is the perfect digital mixer to get into if you're in the studio and perform live as well. This integrates well with my setup on and off the stage. Sound quality is pristine, cost is affordable, and it's flexible enough to grow with my needs for the future. The only thing that is missing is DAW control, but they actually have it in beta testing now and it worked okay so far. I got out of the beta testing, but once they release it to the public this will be a game changer. I love the product. The mixer works great for studio and live sound applications. Sound is very clear and it is user friendly. iPad feature is really a plus. Incredible mixer, with an unbelievable amount of flexibility and routing options. I’ve used the original Presonus Studiolive 16.4.2 for years, and this upgraded version is the cat’s pajamas! I purchased the 16-channel Series III mixer (SL16) as a replacement for my seven-year-old StudioLive 1642 mixer. I mix our cover band from the stage. Although I found the 1642 an efficient mixer, I was quite impressed with the extra efficiency and ease-of-use of the SL16. I updated the firmware as soon as I received the mixer. I used the SD Card option to update the firmware quickly and without any issues. Next, I calibrated the touch screen and faders for more-precise operation. The preamps sounded much cleaner and punchier than the 1642 preamps. Vocals had more presence and clarity even with less EQ than required on the 1642. I have recorded several hour-long (or longer) sets using the SD Card and built-in Capture. I no longer have to use a computer for a simulated soundcheck. Connecting the mixer to a wifi or wired network was quite simple. (Make sure you don't connect the mixer to the WAN port of a router!) I'm still learning and loving this mixer. Alot of improvments over the previous model. Works great so far! I wish it had a USB port for break music. This was one of my greatest purchases thus far. This be board has surpassed any of the boards that I have worked with.